Stories from Myth: My Lord Bag of Rice | SURPRISE ROUND 不意打ち! Today let’s explore the legend “My Lord Bag of Rice” which features a tale that could be almost directly dropped into an adventure in a fantastic setting. My Lord Bag of Rice or Tawara Toda (俵 藤太) is a nickname associated with a historical figure from the Heian period of Japan, Fujiwara no Hidesato (藤原 秀郷). 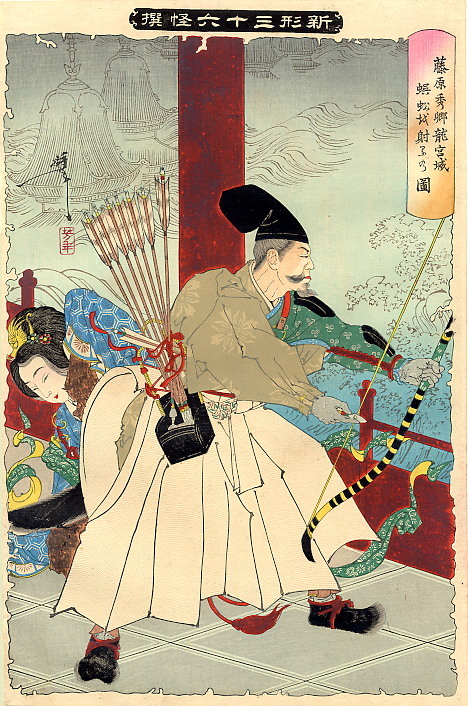 Fujiwara is famous for his role in suppressing the revolt of Taira no Masakado, who claimed himself the “New Emperor.” During this campaign he demonstrated courage and military prowess. Following this he was appointed “Defender of the North” and governor of Shimotsuke Province. This saga alone is enough to inspire an entire campaign. However, we are focusing today on the specific tale that the nickname comes from, a popular legend about him slaying a giant centipede. 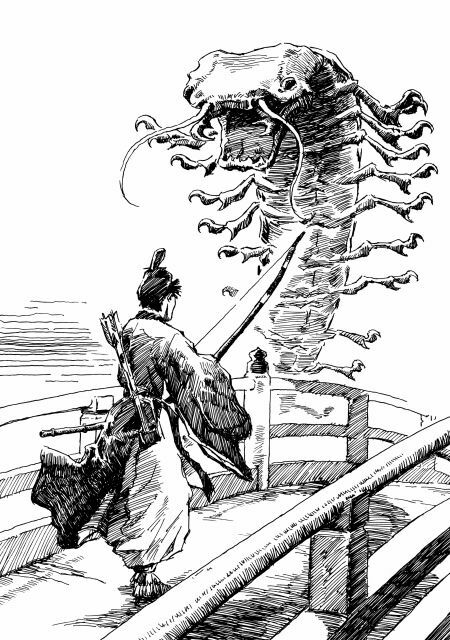 Here is a solid version of the tale of Fujiwara no Hidesato versus the Giant centipede. In brief, Hidesato comes across a dragon lying across the bridge but walks over it, showing no fear. The dragon transforms into a human (either an old man or young woman depending on the version of the tale) and impressed with his courage, asks Hidesato to defeat the Giant Centipede that had been killing its family. Hidesato awaits the monster and lets loose with his arrows when it comes, to no avail. The final arrow, though, imbued with human saliva and sped with prayers to Hachiman pierces the Giant Centipedes head and fells the monster. The dragon, overjoyed, gifts Hidesato with a roll of silk, a temple bell, a bad of rice and other gifts according to the tale. The bell he gave to a temple. The roll of silk and the bag of rice were inexhaustible. From this inexhaustible bag of rice he gained his nickname. Tawara means ‘bag of rice’ but it is also supposedly a play on words referring to where Hidesato came from. There is an element to this tale that sticks out to me, the weak point. 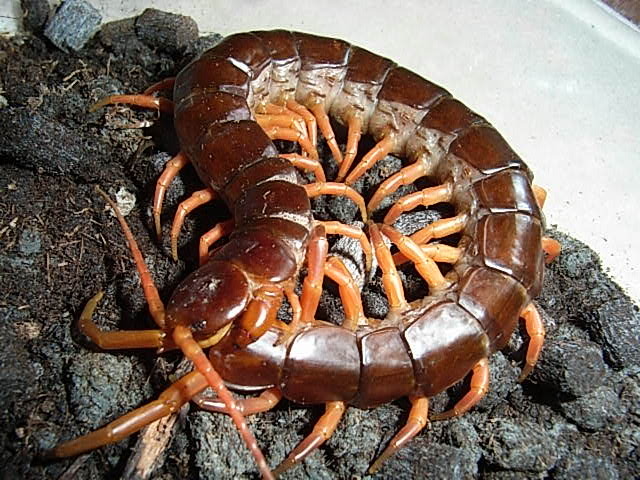 Is it that the Giant Centipede is weak against human saliva? Is it the chant that guides the arrow true? Perhaps Hidesato is just a really good archer? Was the final arrow just dramatically appropriate to fell the beast? I doubt it was human saliva alone that did the job or else the dragons would have just grabbed a random person, had them spit on a stick, and beaten the centipede. Giant Centipede monsters aren’t stamps; you can’t just lick and stick it. Have you seen one of these things? Spit alone (though humorous) just won’t cut it. 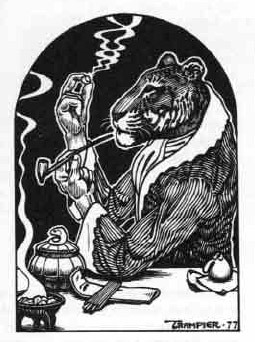 As any Grognard knows, Rakshasa are instantly slain when struck by a blessed bolt. This is one of those unusual but memorable peculiarities of old D&D monsters. Kumbhakarna is arguably the source of this and a large inspiration for Rakshasa as they appear in older bestiaries. In the Ramayana, Kumbhakarna joined in the Battle of Lanka. He was immune to the attacks of the monkey king and the swarms of monkeys that beset him. Rama and his brother were able to defeat Kumbhakarna with arrows and a sacred incantation. I have no evidence to support a connection between these two tales, but the parallels are intriguing. My wild conjecture would be that the Ramayana influenced some of the well-educated writers who compiled the book of tales that featured this story along with other monsters (some of which are drawn from Buddhist lore), if anything. We start with an accomplished adventurer. Add in a chance encounter en route. Fantastic creature seeks aid with monster problem. Monster is invulnerable, but has a specific weakness. As a framework, this story has excellent flexibility and can be easily plugged into an existing campaign or story. You likely have established adventurers in your story and they will travel. They don’t even necessarily have to travel far. This chance encounter could be with a ghost as they cross train tracks, a rogue AI as they are surfing the matrix, pixies as they pass through a forest, or any number of other possibilities. The interesting part of the placement is that the dragon is not specifically barring passage, but this bridge was the only way across the largest lake in Japan, so avoiding the dragon on the bridge would have added a week of travel above what it took to resolve the issue. In fiction this kind of gated element is extremely common. In linear plots and games it is a staple. If you have ever played Dragon Quest or a Final Fantasy game then you know to expect something every time a bridge is apparent. You don’t know what will be there, but you cross that bridge when you come to it. Let’s subvert some tropes and mix it up! While traveling with a gypsy caravan, our group of adventurers are passing through a bog. The area is known as bridge country for the hundreds of small bridges that span the bog connecting patches of dry land. As they approach the second bridge in a chain, a troll seemingly twice the size of the bridge emerges. It oddly doesn’t put up much of a fight, so the gypsy elder prevents the adventurers from burning it’s corpse. Once the troll reattaches it’s severed bits, it imparts it’s tale of woe. A powerful hag resides in the bog who is harvesting the trolls. The trolls have scattered to the far flung bridges to escape her clutches to no avail. The troll begs for aid in driving off the hag. A quick encounter proves that the hag’s diet of troll flesh and unctuous concoctions have made her immune to blades and battle as she regenerates freakishly fast. The gypsy elder recites a tale that suggests the hag has no such immunity to honeyed words! I would love to see where things go from there. This entry was posted in World Building and tagged D&D, D&D4E, RPG, Shadowrun, Stories from Myth, TRPG. Bookmark the permalink.